So not a single comment as to why this is possible? And the answer is......CORNER SPEED!! Yes, but how can a bike with the rider leaning out corner, riding on really narrow tyres, corner faster than a rider hanging off on modern machine with, wide radials? Yes, wider tyres demand more lean for the same corner speed, but the grip and combined lean should give the road racer an advantage that it doesn't have. As it is evident in this vid, it just can: it is possible if it is physically happening. All the contact patches of all the bikes were loaded by similar lateral forces, regardless lean angle, leaning of the rider, type or width of tires. Those lateral forces that tried to skid the tires only depend on the speed of the bikes and the radius of the turns, which were more or less similar for all those bikes. The forces that resist that skid depend solely on friction between rubber and track's surface. Why do you believe are the reasons for the particular conditions of that track (oval, flat, big-constant radius turns) favoring the specific type of bike that arrived first? There doesn't seem to be any need for rapid change of direction, nor is there any braking - at least not for the winning bike, which doesn't have any brakes. Speed on the straights is about 90 mph, with about 60 mph through the corners. Still, I do not know whether this environment favour the winning bike in particular, other than that it has been set up for left hand turns exclusively, but it appears to be. It is also likely that the winning rider has more experience with this kind of racing. Still, I found it interesting that it can even be done, it was cool to watch. Look at the video closely. It appears to me that the winning bike was getting better lean angle even thought the rider's posture was more upright. There were two types of bikes in that video. Standard Supersports (GSXR 600's) and some super light weight bikes. It's fun to compare bikes like these but people tend to forget one simple thing. Balance. You can have simply awesome corner speed if you stick some super sticky tires on a bicycle (or a motorcycle that resembles one) but you give up one thing for that corner speed. Power. If you want a powerful engine it's going to weigh a good bit and you sacrifice your corner speed as a result. You can have all the power in the world by putting a 500hp engine on a bike but the heavier the engine the more difficult it is to convince it to change directions. Hence the design of the modern Superbike. A balance between handling and power. Certain tracks of course are going to favor one strength over another. Super twisty technical tracks are going to favor light weight bikes. Tracks with wide open areas are going to favor bikes that can get up to 180mph in the blink of an eye and then slow down quickly for the tight bits. 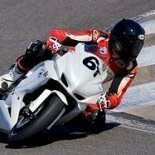 My "home track" these days is Atlanta Motorsports park which is a track that favors light weight bikes. I actually still have a LOT of fun there with my 200+ hp S1000RR even though I can't really put down the power and usually stay well under 130mph. The leader is perpetually sliding and holding the bike up with a flat foot on the inside. He is in a different mode from the street bikes, say dirt bike mode. He is not beating the limitations that bound the road bikes but he is using a different technique. As I understand it, you can lean the bike further if your leaning out than if you're leaning into the corner. Not sure if you remember the statistics I posted with what hanging off vs sitting up vs leaning out meant on various bikes, but the motard cornered at least as fast with the rider leaning out and pushing the bike down as with hanging off. The bike was leaned over far more when the rider was hanging out. Someone gets it. Form follows function. Ride a heavier sportbike "dirt bike" style and you probably have a good chance of getting hurt when the physics don't work quite the way you want them to. So let's explore this skinny tire versus wide tire question. WHY do high horsepower 1000cc bikes use a wider rear tire than low horsepower bikes? We know friction is NOT dependent on surface area, so who can offer up some reasons the tire needs to be wider on an S1000rr, for example, compared to, say, an SV650? Or a roadracing bicycle? Well my "educated guess" would be for a wider surface area on the contact patch. Big powerful bikes put out lots of torque in order to propel them forward at speeds that make us grin so wide in our helmets while we are on the gas. Without a larger contact patch the torque would quickly overwhelm the contact patch of the rear tire and the torque would not be able to be transmitted to the ground to propel the bike forwards. I believe the wider tyre is to spread the load, and hence prolong wear and prevent overheating. A narrow tyre can probably overheat within seconds if you try to load it with 200 hp. A good comparison is the Moto3 vs MotoGP; the former have much higher cornering speeds and much smaller tyres, but also far less power. Those are two very good reasons! Bigger profile has more wall surface to transfer the heat into the surrounding air, bigger mass of contained air (harder to heat up and higher cushion capability), more rubber to wear within the contact patch and less pressure of contact (weight / area), which leads to lower temperature of the rubber. It is not only the power and torque during hard acceleration, but how frequently the rear tire is close to support the full weight of bike plus rider (close to wheelie). Not all is good regarding wider tires, since there is more unsprung weight, higher rotational inertia and bigger lean angles of the chassis. There are many reasons for the differences among those three types of bikes: it would be interesting repeating that race for a supermoto track and for a supersport track. Irregularities and traction of each surface, as well as layout of each track, make a big difference in machine design and performance riding. The question is brought up in almost every engineering physics class when we cover friction. Homework question is usually something along the lines of "If force of friction is only dependent on the coefficient of friction and the normal force" then why do race cars have bigger tires than your average car?" You can even see this question in MIT's open course on Physics covering friction available at MIT site or youtube... I kinda speculate my professor lectured based on theirs. The answer is and has always been... "Pressure", those that have bicycles at some point you probably experienced a blow out... usually because the pressure exerted on the tire was too great. It's also why you use lower tire pressure when on the track compared to the streets. Unlike the streets you don't have stop and go traffic and the tires heat up (which raises pressure), and heat up a lot, more horsepower and heavier the bike the more pressure. Ways to handle this is by compound of the tire, contact patch, initial cold pressure, and of course use larger tires. The winning bike in the video is a modified monster Autorace machine; the oval track is Kawaguchi, Japan. 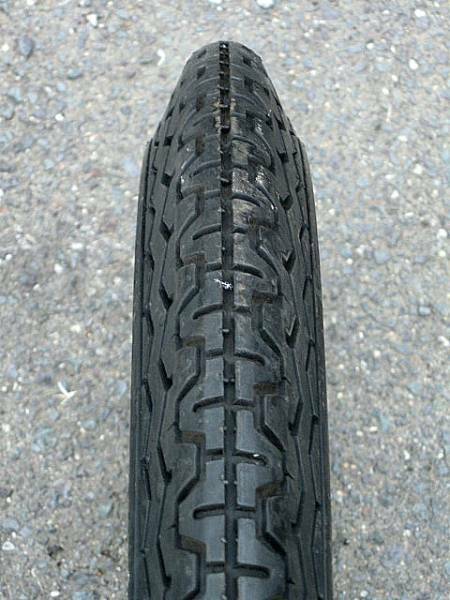 This is the tire's profile of a Dunlop KR-73 installed in this bike: little resistance to rolling straight up and added surface when leaned over. And it would wear like a bugger in Highway use due to the lack of serious corners unless the centre tread was a very hard compound.